Senator Jeff the Flake of Arizona has been a Rino obstructionist to President Trump’s agenda, which is the agenda of We the People, since forever. The Flake is an establishment hack who actually appears, like the other senator from Arizona, to be in the wrong party. 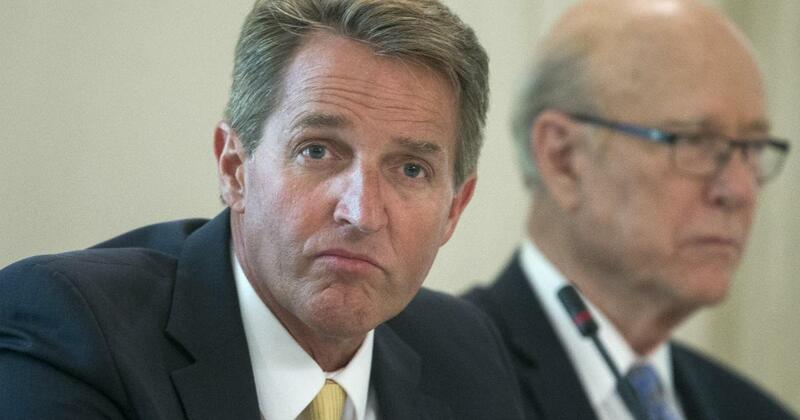 With an 18% approval rating in his own state, the Flake appears to be in serious trouble. The question is who will President Trump be endorsing in five days. Kelli Ward is the only declared challenger to the Flake, but there appears to be some tension in that relationship. It is rumored that state Treasurer, Jeff DeWit will announce very soon. He was the leader of candidate Trump’s presidential campaign in Arizona. The smart money is on DeWit. We will find out on Tuesday, but whoever Jeff the Flake’s challenger is, President Trump has vowed his full support and a big, fat bankroll. President Trump’s new campaign trip to Arizona next week has state Republicans speculating that he is going to endorse a primary challenger to Sen. Jeff Flake. Mr. Trump is leaning towards endorsing Arizona Treasurer Jeff DeWit, state Republican sources told The Washington Times, in a move that could help crystalize the race. Mr. DeWit, who was chairman of the Mr. Trump’s 2016 presidential campaign in Arizona, has been eyeing the race but has not yet announced his candidacy. The White House announced the Aug. 22 rally on Wednesday, and it comes at a time when Arizona has emerged as a key test for the GOP, which is riven by pro-Trump and anti-Trump factions. Later on Wednesday though, Phoenix Mayor Greg Stanton called on Mr. Trump to postpone the event, saying it was too soon after a violent white nationalist rally in Virginia. Mr. Flake recently penned a book “Conscience of a Conservative: A Rejection of Destructive Politics and a Return to Principle” that warned Mr. Trump’s brand of populism threatened to destroy the conservative movement and the Republican Party. Endorsing Mr. DeWit would deliver a painful blow to former State Sen. Kelli Ward, who is currently the only declared GOP challenger to Mr. Flake. She ran unsuccessfully last year in the primary against Arizona Sen. John McCain, another of Mr. Trump’s foes in the GOP. Mrs. Ward has been courting Mr. Trump’s support but the president has soured on her, according to sources in Arizona. Mrs. Ward recently meet with the president at the White House but the sit-down grew testy and ended abruptly, according to the source.